Q. One of my trees is covered in webs! Ew! What type of insect is making them? Caterpillars? Spiders? How do I get rid of them? A. My guess is it’s either fall webworms or tent caterpillars. Fall webworms feed on over 100 tree species including white birch, white ash, apples, choke cherry, willow and white elm. 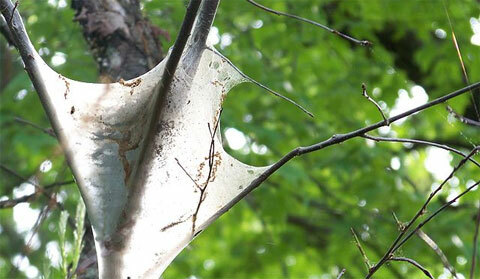 They create tents or silk webs on the ends of branches. In Canada, they have only one generation per year. The good news is that even with severe infestations, trees sustain little permanent damage as infestations tend to occur near the end of the growing season. Also, fall webworms are native to Canada and therefore have natural predators and parasites that help keep fall webworm numbers under control. If you are concerned about the health of your ornamental trees and fall webworms are to blame, prune out the branches and leaves with nests when the larvae are still young. Tent caterpillars could also be making these tent-like webs. There are three common types of tent caterpillars: eastern tent caterpillars, western tent caterpillars and forest tent caterpillars. There are a few differences between each type. For instance, eastern tent caterpillars make their tents in tree or branch forks, western tent caterpillars can encompass the branch tips with their tents and forest tent caterpillars don’t build tent-like webs. Instead they make a silken-like mat on tree trunks or branches. They also differ in which deciduous trees they feed on. Eastern tent caterpillars primarily choose apple, crab apple and cherry. Western tent caterpillars prefer apple, willow, cherry, poplar, plum and oak. Forest tent caterpillars have a preference for poplars and trembling aspen but will also feed on basswood, white ash, American beech, apple, mountain ash, birch, sugar maple, willow, white elm and red oak. In the summer females lay eggs that hatch the following spring; only one generation is produced each year. Infested trees are rarely killed, but tent caterpillars can nearly defoliate the whole tree, causing severe damage. Repeated defoliation can weaken trees and make them more vulnerable to other stresses. The good news again is that these caterpillars are native and therefore have parasites and predators that can help control their populations. But if you are concerned about the health of your tree then the larvae can be removed. When webs and caterpillars are found in the spring, the tents and caterpillars can be removed by clipping and destroying both the tents and caterpillars. This is best performed in the early morning or late in the evening, when caterpillars are typically resting in their tents.